NEW DELHI, India (CNN) -- India's financial capital of Mumbai was put on a high-tide alert with officials expecting a water rise of up to 197 inches (5 meters). 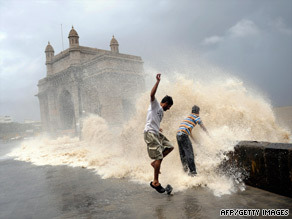 High tides lash the coast near the Gateway of India in Mumbai on Thursday. Sea tides are expected to rise 5 meters Friday, 4.9 meters Saturday and 4.7 meters Sunday, according to a bulletin by the Municipal Corporation of Greater Mumbai. "We have installed water pumps along the coast and advise the people to avoid beaches," said Jagtab, an official at the disaster management control room. Floodgates may also be closed in case the threat mounts, he added. High tides are also forecast from August 19 to 23. At least 467 people have died in floods in India from this season's monsoon rains, federal authorities said in their latest report. Flooding has affected about 1.7 million people in parts of India, according to the disaster management division of the federal home ministry. The country's main weather office has warned of heavy rains in western and central parts of India.